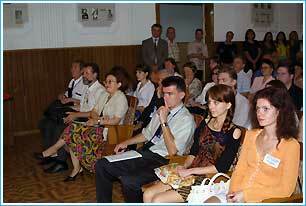 The memorial session was opened by vice-rector of Taurida National University Vladimir Bejansky. (In presidium (from left to right) – prof. N.A. 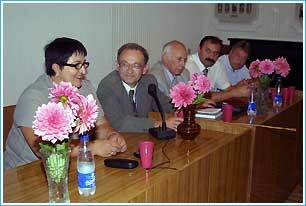 Temuryants ( Taurida National University ) , prof. V.L.Voeikov ( Moscow State University ) , prof. L.V. 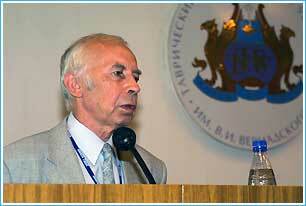 Belousov (Moscow State University) ; V .S. 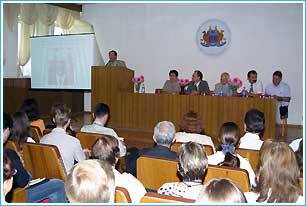 Martynyuk (Taurida National University) , V. Lavrov (Taurida National University). 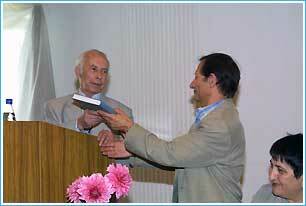 Greeting words of professor Moscow State University Lev Belousov. He presented the book "Biophotonics and Coherent Systems" to the library of Tauraida National University . 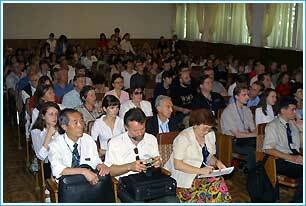 The participants of 3 rd Alexander Gurwitsch Conference. © Copyright 2003. All rights reserved.